If you've had cats in your life for many years, you probably feel like you've seen every cat product that could ever exist. You've tried every toy and your cat has a basket full of fluffballs and feather toys and fake mice. Then something comes along that's truly unique. That's our reaction to The Ripple Rug from SungglyCat. The basic idea is that you have a reconfigurable cat environment that, in theory, should never become boring. It starts with a 47"x35" rug with a rubber backing that you place on the floor. You then add a second rug with holes cut in it and velcro tabs on the back side. 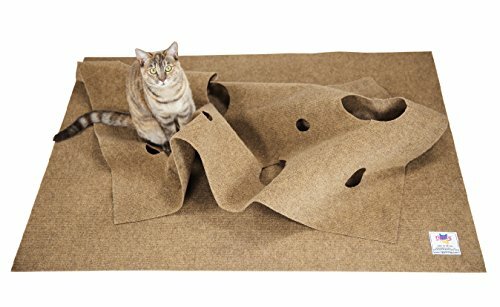 By connecting the velcro tabs to the bottom rug in various ways, you create an interesting, explorable environment for those indoor kitties who need extra stimulation. We were impressed with the design of the toy, if you can call it that. The holes vary in size and have small splits at opposite edges to keep anyone from getting stuck. We also liked the fact that the rugs were made from 100% post-consumer waste in the form of plastic soda bottles. We tested this product with our 9-year-old spokescat, Mina, and she took to it right away. The smell of the new carpet was a little offputting, but she eventually climbed in and started exploring. We reconfigured it a few times and each time, she'd check it out. Unfortunately, she never found it interesting enough to return, despite our many attempts to get her to play in and around the rug. We even tried it in different parts of the room, but she quickly became blasé about the whole affair. This isn't an indictment of the Ripple Rug design. It has more to do with the differences between cats. It's easy to imagine a litter of kittens going nuts over this! The only real downside to the Ripple Rug is its unsightly appearance. While that appearance might attract cats, it certainly won't go far in a room with designer furniture. It's more well-suited to a playroom or patio environment. It's practically impossible to make it look like the messy arrangement of the top layer was intentional. We would also have appreciated the addition of a bendable wire frame around the outside of the upper rug. Sometimes, it was difficult to get it to stay in place in a way that would allow cats to tunnel inside. All in all, we give the Ripple Rug an A+ for innovation. We recommend you give it a try with your cats, especially if they're the sorts who love to tunnel under the bedclothes.